MANILA, Philippines — The Outstanding Women in the Nation’s Service (TOWNS) Foundation Inc. is now looking for nominees for this year’s awards. The foundation conducts this triennial search for the purpose of identifying outstanding Filipino women who, in their various capacities, have served the country well. 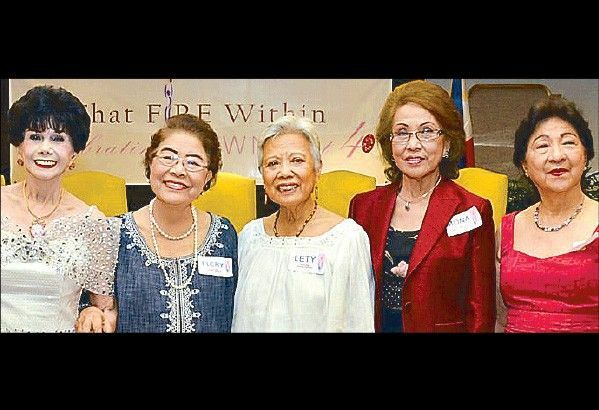 TOWNS awardees are true role models for Filipino women and girls who wish to dedicate themselves to nation-building. The TOWNS Awards are given to Filipinas age 21 to 50 years old who have shown outstanding dedication, exceptional talent, and careers that have contributed in a positive way to society. Nominees should have contributed positively to strengthening national capability and shaping the nation’s future and served as catalysts for economic, social and cultural development, national security and national unity. The award is given every three years during the last week of October and the search for these women is held nationwide for a period of one year. Since its inception in 1974, TOWNS has cited 166 women. TOWNS Foundation Inc. is a national organization of dynamic and effective women who by their common shared activities help transform the lives of the Filipinos. All TOWNS award recipients become members of TOWNS Foundation. In 1995, the TOWNS Foundation was incorporated to support and harness the talent and capabilities of the TOWNS award recipients in activities that influence national issues. Nomination forms may be requested from townsfoundationinc@gmail.com. Completed nomination form may be submitted electronically or by hard copy. Electronic submissions may be addressed to townsfoundationinc@gmail.com or sent to 2004 B, 20F West Tower, Philippine Stock Exchange Center Exchange Road, Ortigas Commercial Center, Pasig City. Deadline for submission is on July 31, 2019. For inquiries, email townsfoundationinc@gmail.com or call 6375535 (Monday to Friday office hours, look for Ms. Ada).